I love my journal. I have made it a daily morning practice just like taking my meds.. I love writing down things in the morning and looking back to see if I can give myself a high five or not. Sometimes yes and sometimes no. It helps to put things in perspective and to not take things for granted but to be grateful. LOVE! So doable and you can personalize! Knowing Lexy, I was excited to learn about her sharing her gratitude practice. We are hearing a ton about gratitude right now and while I KNOW how amazingly impactful it can be, I’ve never been able to keep up a practice. This journal is fluid and inviting. It’s no pressure if you miss a day and gives you space to personalize, color, add your own musings. I love that I don’t feel guilty when I miss a day and that it provides space for morning and evening reflection. Thank you Lexy! I am on my second Trybal Gratitude Journal this year and have enjoyed initiating a daily gratitude practice. The transformation in creating a new, healthy, individualized and personal morning routine has assisted me in starting out on my best foot each morning. The other element I have found helpful with the Trybal Gratitude Journal is reflecting on how my day was the next morning (rather than that evening). This flexibility has enabled me to still consider the positive pieces of my day without committing to the journal 2x a day. I would highly recommend this to any person trying to make a change. It’s been a meaningful step for me and although small, impactful. I love this journal! Most of us know by now that gratitude is always the right answer to every problem and every .blessing. This journal is a warm and inviting book to start and end your days so you can be clear and focused in intentions, surrounded with the power of gratitude. It is a much higher quality book than most journals. Well worth it. I received your a copy of your book on yesterday from my Director! To say I am super excited about this journal is an understatement. I have been practicing having an attitude of gratefulness and gratitude for years, I just never captured my journey in a journal. What a wonderful way to capture my experiences (good or bad) and learn from them. Thank you, for offering us such a great opportunity to learn more about ourselves while practicing to live our best life. This gratitude journal is different! I’ve had gratitude journals that I’ve used over the years and so I thought “Oh, yea, just another journal.” Not!!! The format is different and prompts me to think differently. Alexsys starts each day with a quote that triggers my creative juices. Starting with gratitude and then goals tied to the word for the day. Then the part that ties it all together-an evaluation of the day and words to sleep on. It really does work at so many levels. I am so grateful for this journal and it is helping to turn this year into an amazing one. The best daily routine you'll try! I was a bit skeptical and perhaps intimidated at first, I must admit. Then it happened — the daily routine of using this journal unlocked something powerful. All of a sudden my clarity of focus on what matters most is sharper and commitment to the things I want for myself is easier. The journal and its routine create the space for reflection and creativity. And yes, one does become a more positive person who appreciates life more fully. I believe that people and practices enter one’s life when the universe decides it is time. Lexy entered my life at a crossroads. Learning from her and with her has been an exhilarating and challenging experience. The introduction of the Trybal Gratitude Journal brought with it a structured thoughtful practice that has enhance my abiity to identify and relect on my needs through being grateful for the people and experiences in my life. My daughter and I each have a Gratitude Journal and often discuss the impact and challenges that our reflections bring. This is must for any reflective soul. This journal starts my morning with a positive spin. I love looking for the small things because really that’s what it’s all about. Anyone starting this journey with Lexy by your side (literally! My nightstand ?) is fortunate beyond words. Enjoy! .... come on, go on this gratitude journey with me! This book allows me to see and acknowledge all that I am grateful for in my life and gives me an opportunity to share how grateful I am with others. I love the entire concept of this book. I know it may sound silly, but my favorite part is the inspirational quote for the day. It’s my guide for the day; It’s where I begin. I also love the wrap up every evening. It allows me to reflect on my day and all that happened and reminds me how full my life truly is. I’m one of those people who’s mind and body is going 100 miles an hour at all times. This gratitude journal allows me 20 minutes a day to slow my roll, as my daughter’s would say. It’s another tool in my life that allows me to live my life on purpose. If you haven’t read it and experienced it yet, I challenge you to do so now… come on, go on this gratitude journey with me! This journal is my go to all day every day!! This journal is my go to all day every day!! When I am happy, sad or just feeling blah I always know where to turn to get my serenity back. I am lost with out it and recommend to every being!! One will not be disappointed but filled with joy !! So artistic, simple, clarifying and inspiring. Easy to do, when you create a habit with such a pleasing and functional design, & this much support! Started on suggestion of a friend. Didn’t expect much. Seemed “soft” and “touchy-feely” as a concept. I was wrong. Brings clarity and intention to an otherwise chaotic head full of thoughts, to-dos, regrets, frustrations, etc. Very simple and easy to use. I’d have dropped it if it wasn’t. Brings peace and calm when it’s often needed most. Provides a path to clarity, focus, and self-assurance. Love the clarity and flexibility of instructions with actual examples. Tweak as needed to work for YOU. Highly recommend. I absolutely love my gratitude journal. It has helped me anchor into my journey of helping others Turn up their lights of living out full design. Ask yourself “How do I start and end my day”? This journal will guide you ? I gifted your gratitude journal to my niece, sister-in-law, a client and a workshop participant. All have expressed their excitement and gratitude in receiving! It’s amazing how a little pause in the morning allows me to focus on what’s important. Throughout the day I often reflect back on those written works to keep my priorities aligned. I recently lost my husband unexpectedly and received Lexy’s Gratitude Journal as a momento and what a help it has been. More than anything I needed to be able to express my thoughts, fears, and feelings during this difficult time. Most importantly, this allowed me to remember the great times and how much I have to be grateful for even in devastating circumstances. Thank you for this precious gift which is helping me through the dark and back into the light! I will always treasure this and plan to continue using it for my journey through life. My favorite part of the journal is the gratitude in action. It reminds you to take time out of the day to call the people you love and tell them how you are grateful for them. On those days you feel truly connected to another human being. The gratitude journal has inspired me to take a little or a long time out of the day for me. I like to write in it in the morning as it gives me a purpose to focus on throughout the day. At the end of the day, I enjoy going back to look at what I wrote and to see that I have been working on it all day. The one aspect of the book that I have enjoyed is the daily quotes. I like to think about what they mean in my life, and I actually write beside them my feelings or thoughts. I write all over my page each day. The boxes are a little too small for my handwriting, but it helps me to understand that I don’t always have to stay within the lines. Yesterday was one of those days where my mind was running at 100 miles an hour- restless and agitated. Then around 4.30 PM I started reading the gratitude journal. As I read Alesxys words of advice/encouragement, and looked at the exercises in the journal, my brain calmed down. In about 20 minutes I was feeling calm, content and in a state of zen! I felt light and wonderful the rest of the evening! It was magical. I am thinking of sharing this with a couple of my friends and family so we can walk the gratitude journey together. A life of gratitude is a beautiful gift. You can love that life without this book however, I don’t know why you’d want to. The format is so well put together. you’ll look forward to using it each day. I have gifted it to friends and don’t know anyone who couldn’t benefit from this tool. I was introduced to this journal as part of my professional development and coaching. Gratitude wasn’t something I was thinking I needed to work on or recognize, however I committed to this journal and daily practice as part of my journey. Through this book I have been able to distinguish the moments that really matter. It has strengthened my patience, helped me to put out positivity and have awareness to what others might thinking and feeling. I am more thoughtful in my personal and professional relationships because of this practice and truly grateful for it’s introduction to my life. Most importantly, this book is simple and inspiring. I appreciate the reflection/growth exercises along the way that challenge me to think even deeper. I am able to commit 5-10 minutes daily, which isn’t easy to do. I have since shared this book with a friend going through a divorce as a reminder that no matter how tough things are, there is always something to be thankful and appreciative for each day. The book is a great tool to make you think about what is good in your life and how to strategically keep doing the things that make you happy. In addition, it helps me plan my day so my commitments are on the top of my mind. Gratitude is not easy but this journal helps!! I love the journal. At first glance, i was overwhelmed at how huge it was. Then I realized that this journal was an opportunity to write my own story with a common theme of gratitude and gratefulness. Honestly, neither come easy to me and this journal has helped me shift my behaviors and perspective on life. This book is amazing in so many ways that I had hoped but couldn’t have fully understood until I started writing daily. The pages are a container for helping channel my gratitude into action. It helps me to realize what I feel most grateful for in my life and catalyze and create more of it in my life! It has been vitally instrumental in helping me shift from a scarcity to an abundance mentality so that I can deepen and grow my power. By focusing on what I have to be grateful for, I realize how much I have in my life to draw resource guidance and energy from! The gratitude journal practice has significantly improved my relationships, my productivity, my well-being, mental health, my SELF-LOVE!, my willingness to use my voice as a change agent in this world and most of all, it’s helped to unleash my wild, creative spirit!! This journal came in to my life at exactly the right time. Gratitude practice seems difficult when you are struggling with grief and the stress of life in general.. But it WORKS. I have to say that honestly, this journal helped me through the loss of my precious little furry soul mate, Fergie. And helped me find the grace, hope and gratitude to keep perspective and find moments of magic and joy that I may not have noticed or acknowledged otherwise. Lots of tears as I wrote sometimes, but I found it to be very therapeutic and realized that the thoughtful introspection the journal guides you though..,,, was helping me FEEL better. Lots better. There are so many journals out there, but this one is special. I’m thankful to the author for sharing this gift with the world. I am very grateful for my journal, it is allowing me to re-discover me! I look forward to writing in my journal. It is helping me live for moments in life and to realize what precious moments we have each and every day. I had a really tough 2017, I feel my journal is helping to get 2018 off on the right foot. I am very grateful for my journal, it is allowing me to re-discover me! The days I don’t write in my journal are not as fulfilling. Give it a try, you’ll be so glad you did! I am. This is my first journaling experience and I’m wondering now why I hadn’t started a long time ago! Through this journal I have been able to unleash positivity I didn’t know was in me. I’m usually “too busy” to take ten minutes for myself but since I began this journey my mindset has shifted completely and I now look for things to be grateful for. You’ll be amazed at what you can accomplish when you’re finding the upside to everything instead of dwelling on the downside. I’m so thankful I found this book and know you will be too! Pick one up, you won’t regret it. I bought myself a gift ?… I had been writing my goals and it has been happening… Once I said I am thankful.. Life makes me see it was meant to happen. Thank you Lexy .. I highly positively you have a gift and it was pass on to me ?? I’ve always been thankful for what I have and now that I have this journal I’m much more intentional about how I express my gratitude. It helps me focus on how I want to demonstrate gratitude, be thankful and measure how I”m doing. I bought a journal for 4 of my friends to show them I’m grateful for their friendship and so we can share in our gratitude journey. If, like me, you’ve ever embarked on what you hoped would become a lifelong journaling practice, only to stare at that first blank page with an equally blank mind, then do not despair… the Trybal Gratitude Journal is here! Every page in Alexsys Thompson’s Trybal Gratitude Journal is clearly thought out and offers users the perfect balance of gentle guidance and creative freedom each time a new entry is added. I have personally seen my days take on more focus, have experienced greater clarity in the time I’ve begun my journaling practice, and would recommend the journal to anyone seeking to, as the subtitle promises, manifest the life you’re meant to live. This isn’t just about noting what I’m grateful for - it’s so much more! This isn’t just about noting what I’m grateful for – it’s so much more! Starting with gratitude shifts my mind to abundance, which then has me set a powerful intention. Then the journal prompts you to write down the action/behavior that expresses this intention, which is brilliant in terms of manifesting! There’s also this part about what you want to take to sleep with you, which embodies this aspect of faith in something greater helping you sort out your challenges. I recommend! I bought this book initially to support a friend doing something brave and amazing. Once I received the book I opened it up and was amazed by it’s content and simplicity. I have many journals and have read my share of ‘self help/spiritual’ books. This journal is different. It’s simply, easy, nonthreatening. I am finding it so easy to grab in the morning with my coffee and fill in the days notes. (takes 30 seconds) Then set the book down and grab it again at days end. Literally it takes less than a minute. Being able to look back at the last few days feelings and progress has helped me. I suggest buying one and giving it a look and also buying one for a loved one. You’ll like it. This is NOT a book full of empty pages… it is a guide (filled with relevant quotes, quips, and stories) that brilliantly sets one up to practice gratitude. We live in a time where we are surrounded by negativity and hostility. The Gratitude Journal gives me a safe place to reflect on, and propagate, positive feelings and actions. In just a few weeks, I have noticed I am more focused on specific aspects of my life that make me feel better, happier, and more at peace with myself — and this is as a direct result of writing in this journal. I ordered this journal for my daughter as a gift. When I received it, I immediately ordered one for myself. The feel of this carefully crafted product is pure pleasure to hold in my hand. It’s beauty, both visually and physically, is an invitation to the user to savor the moments spent filling the pages with individual expressions of gratitude. The additional quotes, tips, examples and personal stories make this journal a truly unique experience in journaling and practicing gratitude. I was asked to review this book on my blog Storywraps and as I did I couldn’t help but be inspired and realize this is just what I need for beginning a brand new year. Rather looking back with regrets from 2017 and looking forward with apprehensions to 2018 I intend to focus on each and every day that is given to me with a grateful, thankful heart. 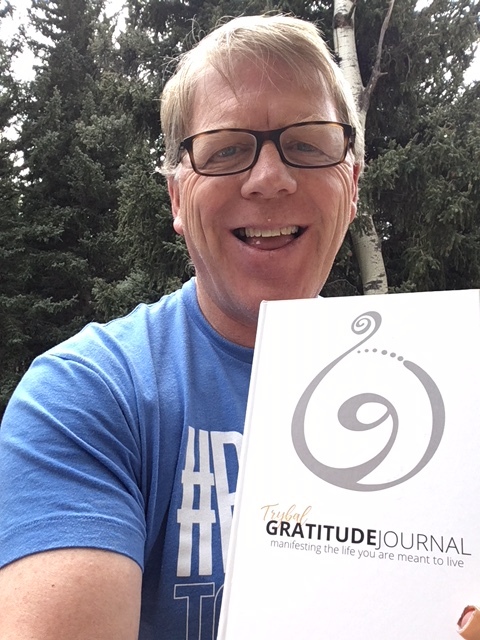 It is a perfect match….the wonderful Trybal Gratitude Journal and a brand new year to start my journaling journey. I look forward to each day starting out with a positive attitude appreciating all the blessings I am privileged to have. I find as I spend time with my Journal counting my blessings and being thankful I am able to pass that positivity and love on to others that I encounter throughout my day. 2018 here I come! I love my Trybal Gratitude Journal. Every time I crack it open I feel the warmth and love that went into creating it. I take that into each day with me along with how I have framed my appreciation from my world. My husband saw it and wants one too! I have long wanted to start a daily gratitude practice, so this journal came along to help with that goal! I’ve been using it since December and really love the humor, ease of use, and fun way it is structured. My husband saw it and wants one too! Thanks Lexy for such a great product. It is my compass towards goodness! I just want to express my delight in this lovely journal. I love the daily practice it encourages, but even more, I cherish embarking on this journey with other like-minded souls in community with each other. I find the quotes especially powerful. Today’s reflection has profoundly influenced an important decision in my life. It is my compass towards goodness! Highly recommend this life tool! Gratitude journal is a great life tool for those who need to understand themselves on a more personal level. When we think of self, we often think of who we are through the eyes of others. This journal not only allows me to be more connected with my true heart, but also does it in a way that isn’t complicated through its layout/format. If you have a tendency to get lost in your anxieties, or simply lost when you sit to write down your feelings, this journal doesn t really allow the space for all the “extra” you might be thinking.there is simply no room in the pages to complicate your intentions and feelings with negativity and extra words. I love this feature because it kind of forces you to really think of what you need, keep it simple and focus on a couple of goals or thoughts, and move on. The end of day practice is pretty amazing. I open the book in the morning.. take a few moments to dig deep and find out what it is I truly need from this day and close it. When I open up to reflect the day, I can see how spending a few moments that morning actually played out subconsciously or consciously throughout my day. I love the quotes at the beginning of each page, they set the tone for my day in a positive direction and leaves the rest up to me. As a new mom, the impact is huge because you don’t have to spend a ton of time. Maybe 20 minutes a day, but those minutes have a big impact because again, the format and layout does not allow you to complicate it with extra words and thoughts. Highly recommend this life tool! The right project, at the right time. My life is filled with technology, distance, and remote connections. I see this also in people I work and play with on a daily basis. There is a very real need to return to some simple truths, and use simple tools to care for ourselves. This book helps me focus on daily simple truths and build on them for bigger ideas and projects. To be honest, I still struggle with making this a daily habit. But that tells me how far down the rabbit hole I have traveled and how much I need this book to keep me focused on what is most important in my life. Each day I open the journal, I find it helpful and empowering. So simple. So far it has been either a) a reminder of how much is good in my life, or b) a reframe of the ho-hum days when I don’t even notice that I’m choosing to focus on the “meh” stuff when there’s so much awesomeness all around me. When I use this in combination with StrengthsFinder, it helps me live out the values behind my Positivity talent. What a cool tool. Everyone needs this book! I always considered myself to be a thankful person, one that consistently showed appreciation to others. After just one month of journaling in the Gratitude Journal, I realized of how much I have missed out. I hurried through things, kept people at a distance, and did not allow myself to experience the joy of situations. I rarely opened my eyes, and never let my soul be penetrated. The Gratitude Journal has turned my world upside down, and I’m forever changed!! I now look forward to moments to connect with team mates, family, neighbors, gym rats, and store clerks. And all their beautiful names are written in my journal!! I recommend everyone to start journaling with the Gratitude Journal. Thank you Lexy for writing this book. How did you know I needed it? This is so much fun, and just in time for my annual “out with the old, in with the new”. Alexsys has crafted a handy, easy-to-follow journal to help develop a daily practice of gratitude. I’ve had a little while to put this into practice, and now it’s something I insist on every day. If you’re looking to shift your mindset into the positive, and grow appreciation and love in your life, the Trybal Gratitude Journal will help you do it! I like the stories that pop up because it keeps me interested and motivated to see what's next. I have been journaling for forty-years, mostly in blank journals or notebooks and like most people, I journal in bursts of activity followed by periods of inactivity. In the last few years I’ve experimented with structured journals like this one and some have turned me off with set dates and an expectation that I’ll never miss a day – this structure brings out my rebellious side. The structure of the Trybal Gratitude Journal is more “gently structured” so when I come to that inevitable period of inactivity it will welcome me back. I like the stories that pop up because it keeps me interested and motivated to see what’s next. I also like the simple and low key color scheme which allows me to bring color and doodles into the journal to personalize and make it more mine. I am generally a grateful person, but there is something about writing down what I'm grateful for that is very powerful. Because of the Trybal Gratitude Journal, I have been more mindful of my blessings than ever before. I am generally a grateful person, but there is something about writing down what I’m grateful for that is very powerful. Couple that with actions, and the journal has made a positive impact on my life and those around me. Admittedly, I have had a harder time with the reflection at the end of the day. Perhaps that’s something I will work up to. Thank you, Lexy, for bringing this into the world. I love to write in brand new journals. My problem is I have quite a few that are about half full. There are several things I really like about this journal. The quotes at the beginning are great. Hearing what others have to say is inspiring. I like having the prompts. That is where I sometimes got stuck with other journals. I like the fact that if I don’t have something to put on every line it’s ok because it will be there t be next day for me to make the addition. I do like the actual feel of the journal…thick pages to write and doodle on. As I read my Bible every morning the journal gives me a place to be encouraged to write down things that come to me from that daily reading. It doesn't require extensive time each day, but has enough steps to help me take consistent action. I’ve been working with the Trybal Gratitude Journal for a little over a month. I like the formal simplicity of it’s format … It doesn’t require extensive time each day, but has enough steps to help me take consistent action. The journal is set-up to help foster intentional gratitude in my life, several times each day. I also appreciate the approach of choosing one word each day as a sort-of mantra for my gratitude focus. Then, circling back just before bed to review my successes, as well as set my mind before going to sleep. In reading the first part of the book, I learned more about how and what to journal than I have from any other source! I am excited to be in the gratitude tsunami! In reading the first part of the book, I learned more about how and what to journal than I have from any other source! Just another example of Lexy being her awesome self! Start my morning with it and end my day with it. Do yourself a favor and buy yourself this present. You won’t regret it! There are more ups than downs! I love my journal. Every morning I take a few minutes to set my intention for the day and focus on the things that I am grateful for. It is amazing how this sets the tone for the day. At the end of the day, I reflect on how things went. Not every day works out the way you had intended, but journaling reminds you that there are ups and downs in life and that is okay. There are more ups than downs! I just started journaling and love this journal! I’m lost for the day without it. It’s the first thing I pick up in the morning. It helps me to set the direction for my day. Not only do I start my day with gratitude I end my day the same way. This journal pulls it all together for me since I’m new to journaling. I wouldn’t know where to start without the direction provided. I actually look forward to my gratitude practice, both in the morning with coffee and evening as I wind down. I actually look forward to my gratitude practice, both in the morning with coffee and evening as I wind down. One of my favorite parts about the journal are the daily quotes that start each day. It feels great when I read one that speaks to me. The ability to be grateful for what ever comes to me and not feel the pressure to fill a list. After a week, I started noticing the peace of mind that having an intention word for for my day, it is a place to go when the day gets challenging. I kind of chuckle when something interesting happens and the word/intention of the day assists in the direction I take to solve it. The surprise pages and short activities further your practice of gratitude and makes you stretch beyond the just the gratitude list. These pages make me smile and assist in my growth towards creating an enriched life. The high five was a challenge in the beginning and now I am looking for my high five as the day goes on. This is helpful to enjoy the wins as they come, rather than letting them go by unnoticed in the day. I hope you will join me in this journey of spreading gratitude and grace throughout our world. Gratitude in Action pages make this thing interactive, powerful, and fun!!!!!!! I LOVE this journal. I’ve been using journals for years now, and most of them are unguided-totally lacking focus. With gratitude in particular, most journals just challenge you to write 3 things you’re grateful for. That’s a great place to start…but, then what? How do I use gratitude to transform my life? Then change the world around me? How can gratitude serve me and others in building a better future? No journal has ever answered this…until the Trybal Gratitude Journal. It’s a joy to use every day-well made, thoughtfully layed out, and personal. The way the author adds words of encouragement, the inspiring quotes, AND the Gratitude in Action pages make this thing interactive, powerful, and fun!!!!!!! I could write pages “oooooh-ing” and “aaaaaaah-ing” about this thing. If you are even remotely considering this purchase, here’s your permission/sign. Do it!!! !